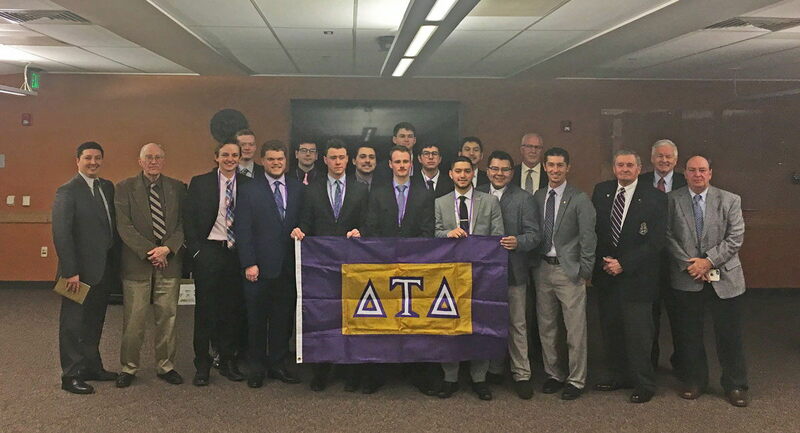 Delta Tau Delta returned to the western edge of the Great Plains with the Epsilon Omicron Crescent Colony on March 8, 2019, at Colorado State University in Fort Collins. An expansion team from the Central Office performed the induction ceremony at the Lory Student Union on campus. Team members included Senior Leadership Consultants Jacob Cantu (University of Oregon, 2017) and Nick Yarbrough (Baker University, 2017) and Chapter Leadership Consultant Zack Day (University of Northern Colorado, 2018) joined by Director of Growth Adam Abbott (Morehead State University, 2017). Nearly a dozen alumni from Epsilon Omicron Chapter and from the greater Denver area gathered for the induction ceremony and an alumni reception preceding the ceremony. Alumni in attendance included Division Vice President Aaron Leiker (Kansas State University, 2005), Colony Advisor Ryan Mayeda (University of Northern Colorado, 1999), Distinguished Service Chapter Member Larry Swanson (Washington State University, 1962) and Former Denver Alumni Association President Bruce Dickinson (University of Colorado, 1973). “The expansion project at Colorado State University was an example of the drive and perseverance shared by members of Delta Tau Delta. The newest group of Delts is dedicated to serving as a positive role model for fraternity chapters and I am excited to see what they accomplish,” said Cantu. The colony’s cumulative grade point average of 3.0 exceeds the all-male average and the all-fraternity average from the fall of 2018. Fraternity staff also recruited a volunteer advisory team led by Colony Advisor Ryan Mayeda along with Assistant Advisor Caden Duve (University of Northern Colorado, 2017), Assistant Advisor Ross Hardin (Colorado State University, 2012) and Assistant Advisor Cody Allenbrand (Colorado State University, 2014). “We are excited to return the Delt flag to the front range. We are excited at the prospect of committing men to excellence in Fort Collins and look forward to the day when we will place the charter at Colorado State University,” said Chief Executive Officer Jack Kreman (University of Nebraska at Kearney, 2004). Originally chartered in 1967, the Epsilon Omicron Chapter represents nearly 400 alumni who have joined the Fraternity at Colorado State University. Delta Tau Delta is among 23 members of the Interfraternity Council at the campus which has an undergraduate student population exceeding 23,000.